If you own property, YOU NEED THIS BOOK. It provides a compact, easy to use record of income, expenses, depreciation, repairs, insurance, capital investment, improvements and summary. It is designed from years of actual experience and usage by CM Huber. So portable too! No software to buy or time spent waiting for the computer to boot up. Simple to use and it is set up letter size, landscape format. At the end of the year, just add up the totals and give to your accountant for tax preparation purposes. The cost of this book is tax deductible as well! The facts are crystal clear, YOU MUST KEEP RECORD. 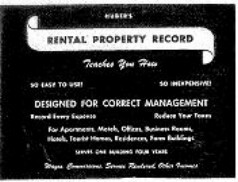 When choosing your record keeping system, keep in mind that you may have more than one tenant per unit per year. Example: Mary lives in Suite 1 from Jan. to June the Joe moves in to Suite 1 from July to Dec.